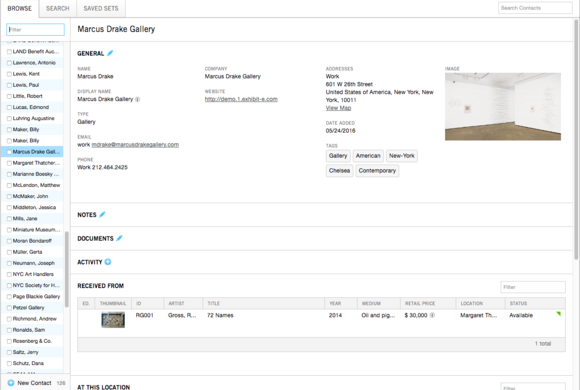 Accessible from any computer or mobile device, galleryManager brings the future of inventory and collections management to the art world today. galleryManager was developed by exhibit-E, a unique design and technology firm that has taken a leadership role in providing websites for the art world. With the release of 2.0, galleryManager seamlessly integrates with exhibit-E websites—push artworks to your website and manage both systems from the same dashboard. With galleries attending over half a dozen art fairs a year, on-the-go access to inventory is essential. That's why we created the galleryManager iPad/iPhone app. It's FREE for all galleryManager subscribers. This is an ideal tool for offline viewing and presenting select groups of artworks and information while on the go. It syncs automatically with your galleryManager account—no exporting or uploading files or jpegs. The size and turnover of gallery staff demands simplicity of technology and quick and easy training. Galleries want a system that does not require taking courses to understand, and a mobile system that allows access to their most important assets when traveling. 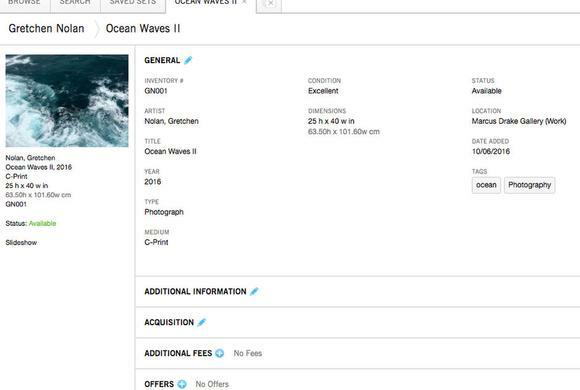 We designed galleryManager to meet the needs of the galleries—thoroughly Beta tested by ADAA Member galleries the system is fast, secure, and easy to use and customized for art world Users. Hurricane Sandy revealed the fragile nature of location-based inventory management systems. There were quite a few galleries that did not anticipate what a good soaking would do to their database. With waterlogged servers sitting in the gallery, and lost data, those galleries were out of commission. As an encrypted web-based application, galleryManager keeps your data safe and secure in the cloud. And with daily granular back-ups there's no need to worry. 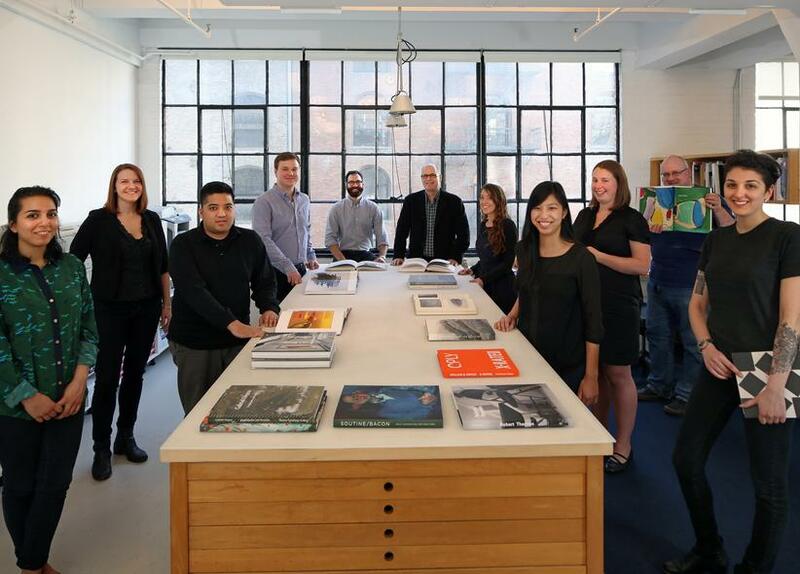 Our offices are located in a 3000 square foot studio space in the landmark Starrett-Lehigh building in the heart of the Chelsea art district in New York. Our highly motivated team takes pride in providing the highest level of service to our clients. Don't hesitate to contact us to see how we can help you. Via email at support@gallerymanager.com or call us at +1 212 625-9910. 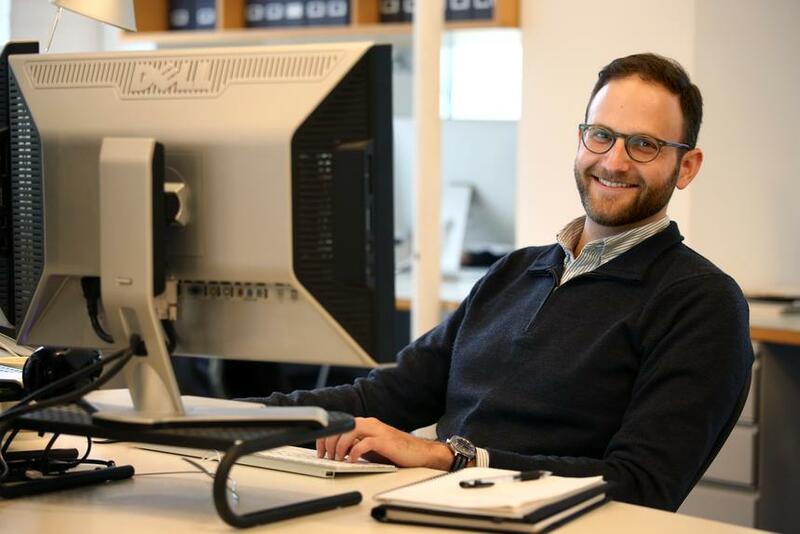 Our technical support team (pictured: Jesse Bennett, Director of Support) is always available via email or over the phone during normal business hours. Please don't hesitate to contact us at support@gallerymanager.com or call us at +1 212 625 9910.
galleryManager represents the latest in cloud-based inventory management software. Beta tested by ADAA Member galleries, the system is customized for the art world. As a web-based system, galleryManager can be accessed anywhere you have an internet connection. 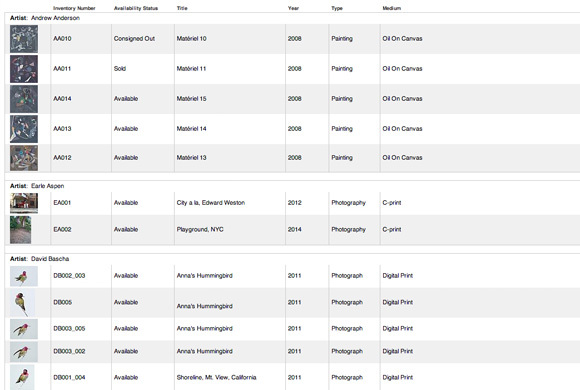 Track all of your artwork details, purchases, consignments, loans and ownership history. 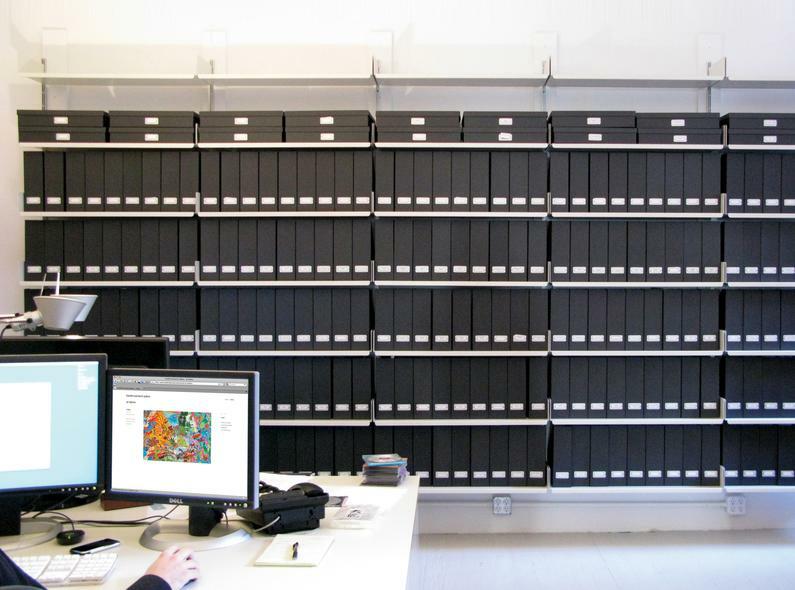 Organize your contacts' information and keep abreast of all artwork transactions related to your collector list. Easily group together works into Sets for use in creating checklists, processing transactions, displaying on your mobile device, and more. Generate reports from a dynamic list of options. 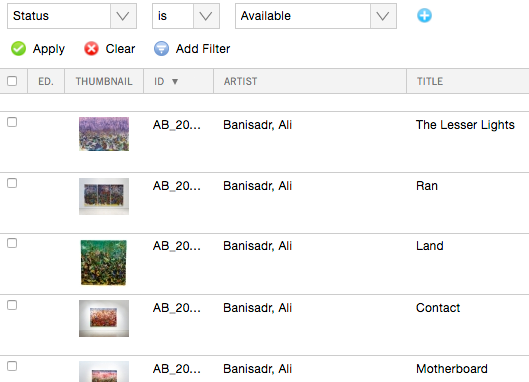 Find and export artworks by location, status, availability, type, tags, and more. Create and manage full editions with artist proofs. 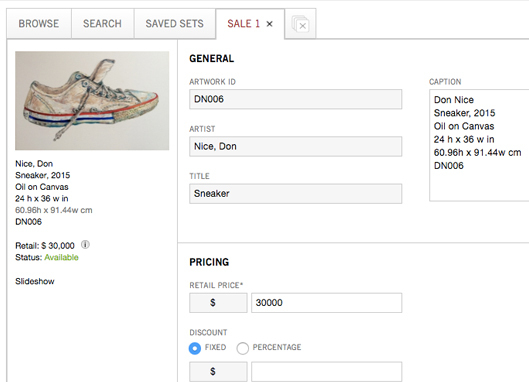 Quickly find and group artworks or contacts by tagging them with keyword descriptions. 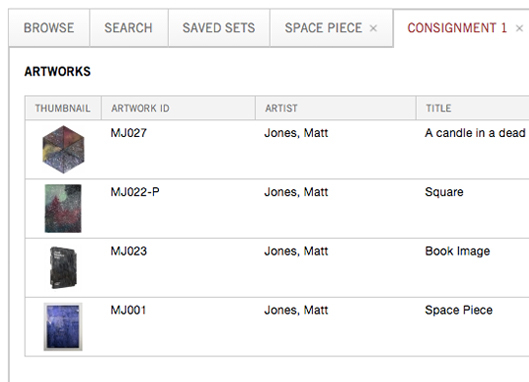 Create an automated invoice from the sale of one or multiple artworks from your inventory. Stay on top of all incoming and outgoing consignments. Loan one artwork or multiple artworks at the same time. Each loan can be tracked from your artwork or contact list. galleryManager is thoroughly compatible with Mac or PC and does not require any software installations or upgrades. 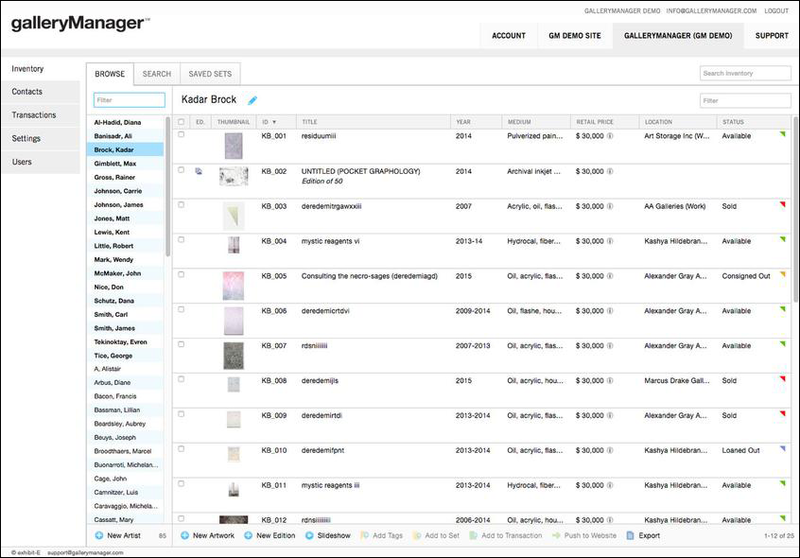 There are two very powerful ways to search for data in galleryManager. 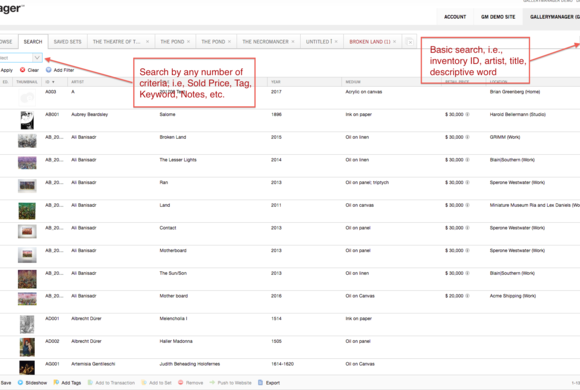 You can use the quick, basic search feature to search in Inventory (see image detail on right), or you can do a deeper search, by criteria, with any number of variations (see image detail on left). galleryManager seamlessly integrates with exhibit-E websites—push artworks to your website and manage both systems from the same dashboard. If you'd like to join us for an in-depth, live demonstration, please sign up here. Simplified Pricing. First 30 Days Free. 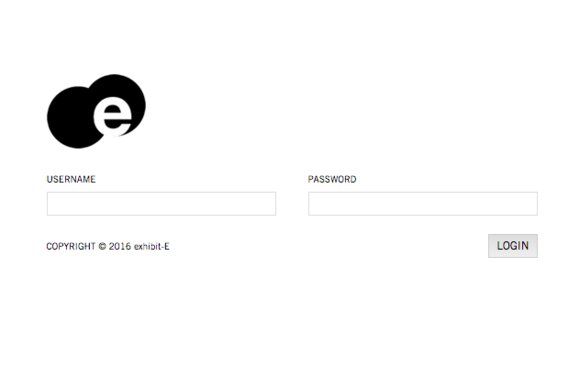 One user account means that all authorized staff use the same log-in credentials. 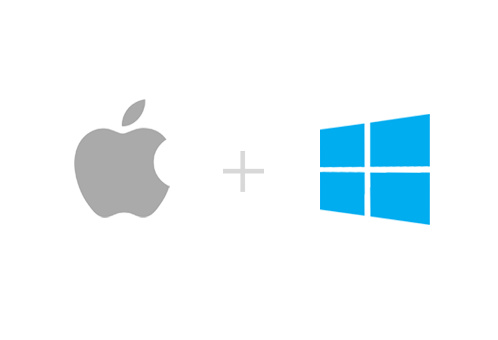 With multiple user log-in credentials, set access levels and system tracking per user. With unlimited user log-in credentials, set access levels and system tracking per user. If you have an exhibit-E website, enjoy seamless Website integration with galleryManager—push artworks to your website and manage both systems from the same dashboard. FREE unlimited email tech support, includes access to support—the knowledge base of our team—24 hour response time. A basic document template created with your gallery letterhead for tearsheets, invoices, offers, consign out, loan out, shipping, artwork report and list documents. —Marianne Rosenberg, Rosenberg & Co. The first step is to select your plan from the Pricing section above by clicking on the “Choose this Plan” button below the option of your choice. You will then be prompted to enter your billing information. We need this information up front to set up your account, but your card will not be charged for the first 30 days. After 30 days your payment will be processed. You can cancel anytime prior to the 30 day period. How does the 30-Day Free offer work? When you sign up for galleryManager and provide your billing information, your credit card will not be charged for 30 days. Yes, we are giving you 30 days free, compliments of galleryManager! After 30 days your payment will be processed. You can cancel anytime prior to the 30 day period. I'm using galleryManager 1.0, but want to switch to 2.0. How do I do that, and is there a fee? If you are a current galleryManager subscriber (in our 1.0 system) and would like to transition into galleryManager 2.0, please contact our Support team at support@gallerymanager.com. Like all updates to the system, the import into 2.0 is FREE for existing subscribers. For more information or if you have any additional questions, please contact our Support team at support@gallerymanager.com. Can galleryManager integrate with my website? 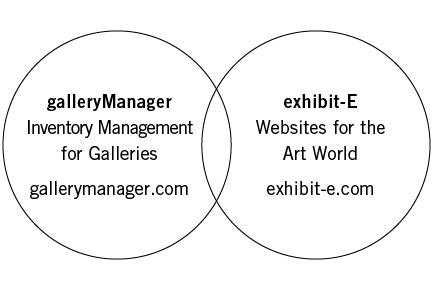 galleryManager integrates seamlessly with exhibit-E (our sister company) websites. Clients who have both systems will benefit from being able to manage them from the same dashboard. 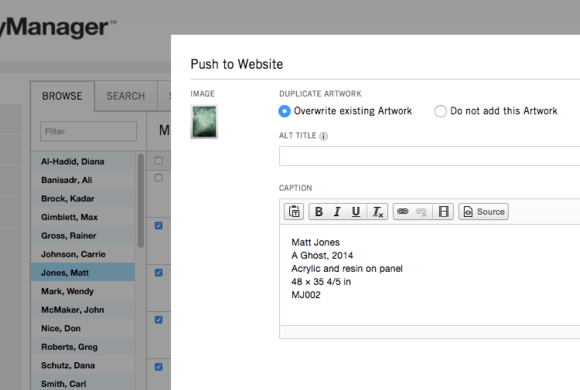 Easily push artworks from your galleryManager account to your exhibit-E website. To see this in action, please visit our Videos & Support page. And for more information about exhibit-E please visit exhibit-e.com. Is the galleryManager iPad/iPhone app only available to active galleryManager subscribers? 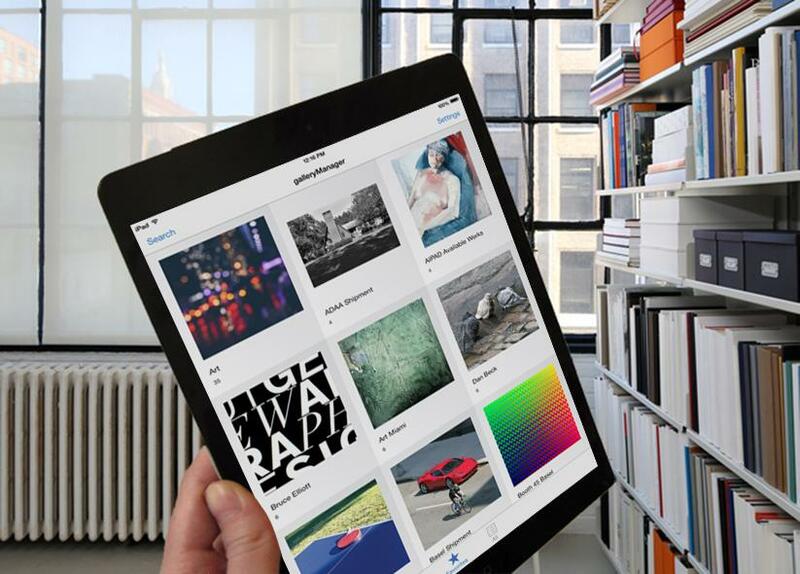 The galleryManager iPad/iPhone app is only available for active galleryManager subscribers. 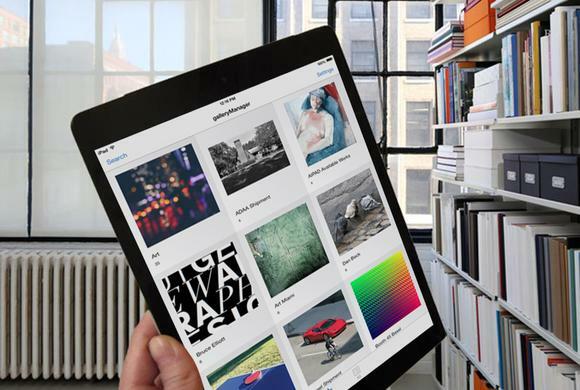 It's an ideal tool for presenting curated sets of artwork and information while on the go. It syncs automatically with your galleryManager account—no exporting or uploading files or jpegs—and works offline. The iPad/iPhone app is FREE for all subscribers and can be used on as many devices as you'd like. The security and privacy of your data, payment, and information is very important to us. We pride ourselves on conforming to industry security standards and the latest best practices. Credit card information is securely encrypted and stored by Braintree, a trusted, Level 1 PCI DSS compliant payment gateway and payment processing provider. All other account data is stored on one of the most secure server platforms available and is accessed via a secure SSL connection, a feature utilized by online banking and ecommerce systems to ensure safe data transfer. Can galleryManager import my existing database into my new galleryManager account? We are import experts! 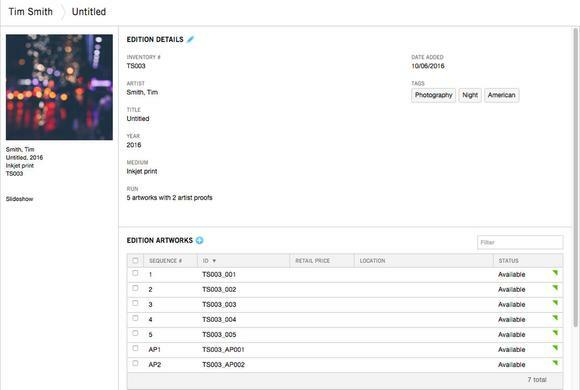 If you have an existing database we can import it into your galleryManager account. 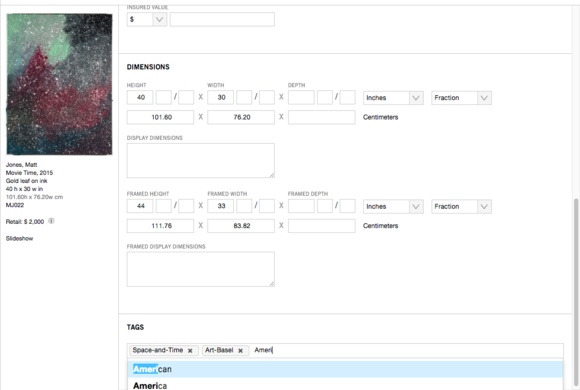 We've imported databases from ArtSystems, Artbase, Access, Filemaker, and more. Please contact galleryManager support for an estimate at support@gallerymanager.com. How do I get my Letterhead into the system and how do I customize my documents? You can enter your letterhead directly into the system under the Settings tab. Letterheads entered in this section can export onto all document types, such as invoices, tearsheets, and more! For more information on how to set this up, please view our Support page. If you would like to further customize a document by changing its default layout or font, please contact our Support team for an estimate at support@gallerymanager.com. Does galleryManager support multiple currencies? Galleries all around the world use galleryManager, so the system absolutely supports multiple currencies, including EUR, USD, JPY, SEK, GBP, CHF, HKD, BRL, AED, CNY, PHP, and more. We can also add additional currencies upon request—just send an email with your request to our Support team support@gallerymanager.com. How does galleryManager calculate exchange rates? galleryManager pulls its exchange rates from a trusted third-party platform that is used by thousands of commerce-based platforms, including Shopify, Kickstarter, and Braintree. The current rates are updated hourly and the "Historical" rates are drawn from EOD (end of day) values for that specific date. Can I track individual user activity? User activity tracking is available for subscribers with Pro- and Ulimited-level plans. You can easily switch to a new plan by going to Settings. Once you have your multiple user account set up, go to Users and add users. Once you have done this, you will be able see which user has performed which transaction. It should be noted that you can also set up access levels for each user, i.e., user A can access contacts only, and user B can access Contacts and Artworks but can not see financials, etc. Can I set different access levels for my staff? Subscribers with Pro- or Unlimited-level plans can set different access levels for each of their users. So, for example, if you would like to prevent one user from seeing financial information, you can block that data from appearing for them. For more information, please visit our Videos and Support page. Can I remove and add users? Yes, subscribers can easily add and/or remove users. Just go to the Users tab in your galleryManager account. If you add more users than your current plan allows, you will need to choose another plan (Pro or Unlimited) that suits your needs. Accounts can be downgraded or cancelled at any time, under the app's Settings tab. However, as we do not offer refunds for charges that have already been incurred, we advise starting with the plan that meets your needs today and upgrading later as your needs change. No, we do not offer discounts on up-front long-term commitments. We only accept monthly payments. galleryManager is an online Web application and cannot be downloaded. However, users can export virtually all of their Artworks and Contacts data into Excel spreadsheets at any time with a few clicks. This is done by using the Search & Sets tab within the app. Are subscriptions to galleryManager prorated? Subscriptions to galleryManager are not prorated. Subscriptions are paid upfront for the month. If cancel your subscription, you are just cancelling your automatic renewal—you will still have access to your account until your month is up. galleryManager plans are month-to-month. We make it simple to start or stop your service at any time. 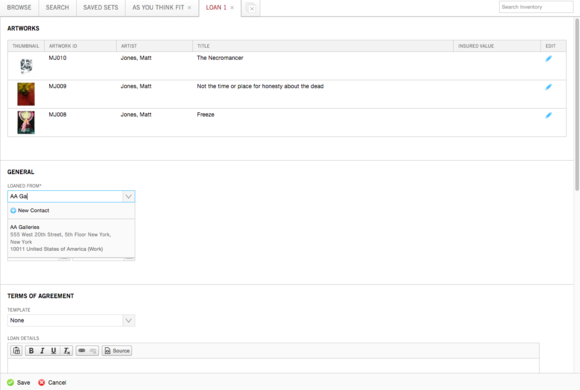 Canceling galleryManager is an easy and no-questions-asked process. Just log into your account, go to Settings, and cancel the subscription in the Subscription tab. Your subscription will automatically expire at the end of the current billing period. 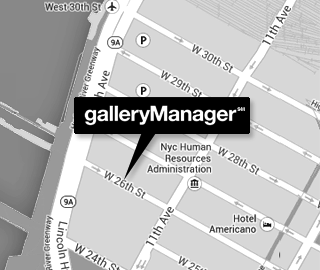 Our support team can answer any questions you might have about galleryManager. If you have an existing database we can import it. Contact us for an estimate.